Looking for something special? We'll find it or we may have it ! New items arrive daily! When he was just 13, Steve began building speakers and playing electric guitar. His enthusiasm for high fidelity grew as he devoured audio magazines, and visited any audio store he happened upon. While in college he was well known for his audio systems. He would invite his friends to listen which frequently led to being asked his advice on purchasing a system. Steve saw the opportunity to earn "pocket money" so he built more speakers, and began buying and selling used equipment. Best of all, he truly enjoyed doing it! After receiving his BA in communications, and a minor in music theory from Ashland University in Ohio, Steve moved to Walton, NY and worked producing radio shows at a recording studio in Binghamton, NY. He was a frequent customer of the local McIntosh dealer and had one of their systems in every room of his house. It was here that Steve met Frank Gow and Ernie Schleider. In 1979, the dealer went out of business and Steve bought their remaining McIntosh inventory. While on the way home with the components, Steve made stops to visit local audio enthusiasts that he knew, selling several pieces. This became the beginning of the part time Audio Classics business. Five years later, Steve devoted himself full time while working out of the basement of his home. The operation soon outgrew this location, so he moved Audio Classics to the basement of the Walton Post Office in 1987. A devastating flood struck ten years later, and with the help of friends and family, he was able to save his inventory, and realized it was wise to relocate to higher ground. Steve searched for the right building and chose our Vestal, NY location, where Audio Classics has been doing business since 1997. Listening to music is a lifelong passion of Mike's. It started with his Mom when he was just a kid, she always had music playing morning till night in the house or in the car. At age 8 he swept the floor's and emptied the garbage at the local music store to earn enough to buy his first hifi system, a early stereo setup with detachable fold out speakers. His mom realized how much he enjoyed listening to music, so on his fourteenth birthday she bought him a Lafayette integrated amplifier and tuner with separate speakers. Over the years he developed an affinity for panel speakers and owned several from Magnapan, Acoustat, Sound Labs and Martin Logan. He would pair these speakers with various amplifiers including Krell, Levinson and Counterpoint trying to get it right. Then in 1989, while working a full-time job, Mike began helping out part time at Audio Classics until Steve mentioned he was looking for full time help in sales & shipping. From this point his hobby turned into a job and still is his hobby to this day. In addition to sales, Mike specializes in physical detailing and mechanical functions of pre-owned equipment. He also evaluates new audio products as they are introduced and performs critical listening trials to pair components that work well together. There is always music playing somewhere in his house from one of his McIntosh systems, this must run in the family. If you email him your likely to get a fast response most any time of the day, evening or weekend. As a self taught musician, Ryan grew up with an ear for music. He began learning to play guitar at age eight then went on to play bass guitar and has been performing in local bands for 25 years. Ryan has twenty years experience working with Audio Classics and is one of our knowledgeable audio sales consultants. Being a musician also helps Ryan suited for helping out with our Taylor and Martin guitar sales. In addition to sales, Ryan also manages our service department and personally oversees all work brought into Audio Classics for service or reconditioning. He acquired service knowledge from working along side McIntosh technicians and engineers, and received formal training from manufacturers. He's an active contributor to various audio related Internet forum groups and hosts social gatherings with international audiophile clubs. Ryan's an enthusiast of new and vintage two channel McIntosh equipment and rotates auditioning various components for listening at home. Contact Ryan for new and vintage sales or if you have a component in need of service or reconditioning. Ernie served in the US Army from 1969 to 1971 as an E5 Sergent and after completing his term, enrolled at Broome Community College and SUNY Binghamton. While a student, Ernie began his audio career working with Frank Gow at Weeks & Dickenson, one of Upstate New York's largest full service audio and music retailers. The store encompassed five floors of showrooms, studios, repair facilities, an auditorium and a radio station. Ernie became the manager of the audio department during his first year of employment. It was here that Ernie met Steve Rowell, president of Audio Classics. Steve was a frequent McIntosh customer and the two became friends. Ernie earned his associates degree while working at the store and remained working there until the company closed it's doors in 1978. Ernie later worked in sales or management positions at a variety of retail companies ranging from pharmaceuticals to furniture and he owned a part time business making custom golf clubs. Ernie kept in contact with Steve throughout the years and purchased audio components from him. As Steve's audio business grew, a position became available and Ernie came to work for Audio classics in 1997. Ernie has five systems at home, consisting of new McIntosh, vintage tube, electrostatic speakers, Klipsch Cornerhorns, Mirage, Sonus Faber. Give him a call to place your next order or get friendly advice to find the right gear for your application. Ryan is our highly experienced sales consultant and manager of our service department. Ryan began working with Audio Classics in 1992. Call Ryan for any sales related questions or service inquiries. George is an independant service consultant to Audio Classics. He is a retired IBM Senior Engineer with 8 patents and 15 publications to his credit. George headed a group of individuals who restored and rebuilt a Robert Morton Theater pipe organ at the forum in Binghamton. If it's electrical, mechanical, metal, wood, analog, digital, solid state or tube, George can make it work. Inventor and independent consultant to Audio Classics, Rich Modafferi has established himself as one of the world's foremost authorities on tuner and loudspeaker design and development. He holds Masters degrees in Electrical Engineering and Computer Science from the NJ Institute of Technology. A Senior Engineer at McIntosh Laboratories from 1968-74, he designed the MR77 and MR78 tuners and the famous "Rimo" filter. The MR78 tuner has received world wide acclaim for its State of the Art performance. From 1974 to the present, Richard has been a self employed inventor at Modafferi Acoustical Systems, Inc. He has been granted a United States patent for Phase Shift Bass Loading and for the Infinite Slope Crossover. These patents are currently being licensed to Joseph Audio of White Plains NY for use in their speaker systems. Richard also serves as a writer, reviewer and test lab for Audio, Audio Critic, The Sensible Sound. Dave Pipher, a service technician in the McIntosh service department from 1971-1980, the last of four years of which he was the lead service technician. Dave served 27 years with Lockheed Martin where he was a lead technician in many US Navy, US Air Force and NASA avionics suite development laboratories. Most notable of these, was the lead technician on the Space Shuttle Challenger disaster recovery team. Dave was the lead technician for a US Navy helicopter avionics suite development laboratory, prior to retiring in 2006. With the knowledge gained while working in service at McIntosh Laboratories, followed by the detailed and quality oriented technical work with mission critical electronics, Dave has proven to be an exceptional fit in servicing McIntosh equipment for Audio Classics. Kevin comes from a musical family and began playing the French horn when he was 12. He became interested in audio around the same time and started building kit audio equipment and speaker enclosures for friends while in high school. 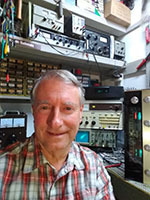 With the ongoing improvement in the quality of electronic components over time, he realized that older equipment could often be tweaked to sound better, and this discovery began a life-long interest in audio equipment. He attended Carnegie-Mellon University and earned BFA and MFA degrees in music performance, and was a member of the Caracas Philharmonic for several years during the early 1980s. When he returned to the States in the mid 1980s he continued to freelance around the Buffalo NY area, but got a day gig working for NYSEG which turned into a 30-year career in various capacities beginning with performing energy audits, marketing, credit, and finally program management. He recently retired from NYSEG and now is having a blast working for Audio Classics. His specialty is restoring vintage tube and solid-state equipment. Aaron is Audio Classics shipping manager and joined us in 2008! He makes sure your purchase is packed very well and shipped safe. Aaron has shipped McIntosh equipment all over the world! Contact Aaron for McIntosh cartons, remotes, and wood cabinets. Dave joined Audio Classics in 2007. He's been an audio equipment enthusiast since he was ten years old. Contact Dave for information or questions about our items listed on ebay. Kelly joined Audio Classics in 1999 and is responsible for keeping it all together financially. Call her for questions about your account. Please TAB or click through the form, hit enter only if ready to send. Would you like to receive email announcements and special offers from Audio Classics?